On Monday, the 18th of March 2019 Worldpay and FIS announced that they have entered into a definitive merger agreement, with FIS acquiring Worldpay through a combination of cash and shares that values the latter at an EV of close to $43bn. At a value of $112 per share, the acquisition represents a 13% premium to Worldpay’s undisturbed share price. The combined company will have combined pro-forma revenues of $12.3bn and is set to become the global leader in payments technology. Worldpay is an American payment processing provider with global operations that is headquartered in Cincinnati, Ohio. The company specializes in providing digital payment solutions for merchants in 146 countries around the world and processes more than 40bn transactions annually. Worldpay was formerly known as Vantiv, whose origins can be traced to the 1971 formation of the Midwest Payments Systems (MPS) by Fifth Third Bank. The transition from Vantiv to Worldpay came through the 2018acquisition of UK payment processing provider Worldpay Group Plc (previously known as RBS WorldPay) for $10.4bn. Prior to the Vantiv acquisition and shift to the US, WorldPay Group plc had been spun out of the Royal Bank of Scotland in the context of its government bailout during the 2008 financial crisis. For FY2018, Worldpay’s GAAP net revenue increased by 85% to $3.93bn compared to $2.12bn in Vantiv Inc.’s prior year. Had the acquisition of Worldpay Group closed on January 1, 2017, net revenue would have increased by 10% on a pro forma basis. Net income per diluted share decreased to $0.04 as compared to $0.80 in FY2017. The reduction in GAAP earnings was driven primarily by transition, acquisition and integration costs and amortization incurred in relation to the acquisition of Worldpay. FIS is an American provider of financial services technology with global operations that is based in Jacksonville, Florida. The firm additionally provides consulting and outsourcing solutions, serving clients within both retail and investment banking. The company was founded in 1968 as Systematics Inc., which was later acquired by ALLTEL Information Services. Following ALLTEL’s acquisition by insurance company Fidelity National Financial in 2003, it was renamed Fidelity Information Services (FIS). The firm subsequently grew through a string of acquisitions, including the $1.8bn acquisition of Certegy Inc. in 2006 and the $2.94bn acquisition of Metavante Corporation in 2009. Most recently, FIS acquired information technology firm SunGard for a total consideration of $9.1bn in 2015. In FY2018 FIS’s GAAP revenue decreased 2.8% to $8.42bn from $8.67bn in FY2017. Operating income increased to $1.46bn from $1.43bn in the prior year, while operating income margin grew by 80bps to 17.3%. FIS generated a net income of $846m for the year. Earnings per diluted share amounted to $2.55, representing a decrease of 32% YoY. The decrease in revenues was driven by an 8.2% drop in GAAP revenue in its Global Financial Solutions business and a 15% drop in revenue in its Corporate business. The decrease in revenue in both business lines is attributable to divestitures. The electronic payment industry has undergone an incredible metamorphosis over the last two decades. It started off as a rather unimpressive operating branch of the banking industry, but thanks to the impact of technology it has now become one of the most attractive expressions of the fintech revolution. The industry is divided into three main components of the value chain. The first segment is merchant acquirer processing, which consists of all the services involved in debit and credit card transactions, recognition, and elaboration. Worldpay is a dominant player in this segment and competes with the likes of Bank of America Merchant Services, Chase Paymentech Solutions, Elavon Inc. (subsidiary of U.S. Bancorp), First Data Corporation, Global Payments and Total System Services. This segment is being particularly impacted by the advent of new large fintech players such as PayPal, Google, Apple, Alibaba (Alipay), Square, Stripe and Adyen that are increasingly taking over the merchant aspect of electronic transactions by using the new medium of online payment. The second, and central segment, is the Payment network that serves as the infrastructure connecting transactions and ensuring they clear their respective institutions. In this section, there are fewer and more dominant players such as Visa, Mastercard and, to a lesser extent, American Express, that are present globally. Additionally, domestic players such as UnionPay, a Chinese state-controlled provider, dominate individual regions in near-monopolistic nature. The last segment is called Issuer Card Processing, which consists of authorizing transactions received from the payment networks and ensuring that each transaction is appropriately cleared and settled from the originating card account. The main competitors are Fidelity National Information Services (before acquisition), First Data Corporation and Fiserv, Total System Services, and Visa Debit Processing Service. It is worth noting that many clients of the previous segment are large commercial banks that have developed in-house solutions for the first and the third step. 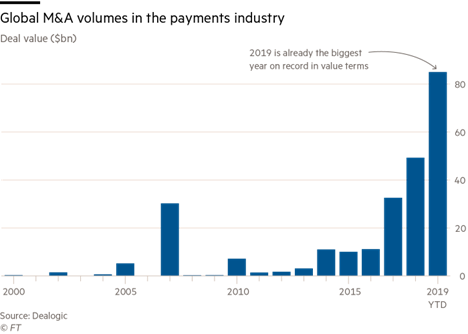 The payment network sector is relatively stable, but the other two segments of the value chain are sprawling with M&A activity. One of the main reasons driving this consolidation is extreme market fragmentation, as the industry remains divided among major banks with in-house solutions, big tech players, and banking divestitures. Unlike the first two competitors, the entrance of banking divestitures into the market was largely a result of the financial crisis and its aftermath. For example, part of the Royal Bank of Scotland’s government bailout was divesting its payment processor into a separate company, which would eventually become Worldpay. The result is a growth of M&A volume from $16bn in 2015 to an impressive $85bn so far in 2019, according to Dealogic data. This extreme M&A growth has been spurred on by large transactions, such as the Fiserv and First Data $39bn merger announced in January, the £9.3bn acquisition of Worldpay by Vantiv in 2017, and finally the $2.2bn acquisition of Izettle by Paypal. These acquisitions, completed in large part by dominant industry players, have pressured the industry into a consolidatory trend. Additionally, an interesting note can be made regarding the industry’s valuation multiples. Rather than reflecting a modest multiple in line with financial institution averages, the payment industry boasts an average EV/EBITDA multiple of 16.5x—a number far more reflective of high-growth industries like technology than a financial provider. In spite of these stellar valuations and overvalued market prices, dominant players are still pursuing sizeable and profitable targets for consolidation. However, these higher prices are driving incentives for buyers to obtain lower premiums in blockbuster deals, as can be seen with the low 13% premium on the Worldpay acquisition. Fidelity National Information Services and Worldpay have agreed to a mixed stock and cash transaction which values the latter at $43bn, including $7.7bn net debt. Worldpay’s shareholder will be given 0.9287 FIS shares plus $11 in exchange for each of their shares. This implies a $112 share price for Worldpay, which represents a 13% premium over the $98.7 close on the previous Friday. The ownership structure of the combined company will be composed of 53% of FIS shareholders and the remaining 47% by Worldpay shareholders. In an environment of frantic M&A activity, culminating with the $22bn takeover of First Data in January, Fintech companies are scrambling not to fall behind. As such, FIS’s acquisition of WorldPay is a vital move to survive in the face of greater competition. With this deal, FIS seeks to achieve greater scale and scope, both of which are necessary to revitalize its slowing growth. After the deal is completed, the combined entity will be one of the largest players in the payments industry, trailing only behind Visa, Mastercard, PayPal, and American Express. Scale is crucial in the payments sector because of the challenge posed by fast-growing tech companies such as Ayden NV and Square Inc, which are offering ever-cheaper payments. By eliminating duplicate operations, FIS expects the combination to slash costs by $400m within three years and thus be able to offer more competitive prices. Scale also has important implications for customer data collection. Through the Worldpay deal, FIS will gain access to 40bn transactions in 146 countries that Worldpay processes every year. Larger pools of data are essential to several of FIS’s segments including its Fraud, Risk Management and Compliance Solutions. Moreover, the Worldpay deal allows FIS to broaden its scope and tap into the high-growth payments sector. With this acquisition, FIS will enhance its acquirement and payment offerings and provide a wider array of services to its clients. The two companies plan to use their complementary solutions and services to develop “the broadest suite of financial services in the industry”. Moreover, FIS and Worldpay expect to cross-sell services to each other’s clients and thus generate an additional $500m in revenue. This cross-selling, in addition to other positives, will allow for significant value creation in the combined company. In addition to approximately $700m in total EBITDA synergies over the next three years, organic revenue growth is expected to be between 6% and 9% through 2021. The combined company will boast pro forma 2018 annual revenue of $12.3bn and adjusted EBITDA of $4.9bn, with strong cash flows to match. In this sense the broadening of FIS’s offerings allows it to not only strengthen its market position, but also its financial bearings. 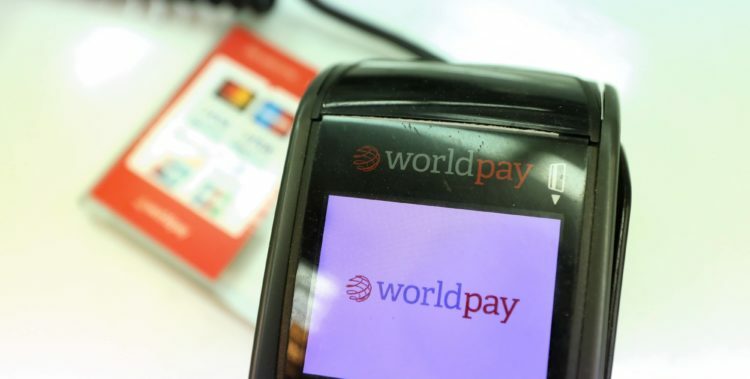 Finally, the deal is expected to enhance Worldpay’s global presence. FIS’s strong relationships with banks in India, Brazil and Southeast Asia provide an opportunity for Worldpay to expand in these fast-growing markets and reach end-clients it would not otherwise be able to. Following the announcement on March 18th, Worldpay shares jumped 9.8% to $108.38 at 1:39 p.m. in New York: an impressive surge given the deal’s lacklustre 13% premium. This surge likely reflects shareholders’ enthusiasm about the lofty multiples of the deal, as Worldpay is trading at about 21 times its 12-month trailing EBITDA. On the other hand, Fidelity National fell 0.7% to $108.08 after the announcement. Nonetheless, this is a small drop for the expensive nature of the acquisition. Investors’ optimism can be explained by FIS’s solid financial position and by its management’s proven track record in delivering and even exceeding synergy targets. In addition, the CEO of FIS declared that the deal would lead to modest EPS accretion by 2020, which should come as a relief to the more anxious investors. Share prices of several European groups rose in expectation of more deals. One of the strongest risers was French Group Worldline, which increased by about 3%. Credit Suisse advised Worldpay on the transaction whereas Goldman Sachs and Centerview Partners advised Fidelity National Information Services. Worldpay and FIS received legal advice from Skadden, Arps, Slate and Meagher & Flom LLP, and Wilkie Farr & Gallagher, respectively.